Few choices are all-or-nothing propositions; they usually involve trade-offs i.e. getting a little more of one option in exchange for a little less of something else. When making choices, people weigh the cost - what is given up - with the benefit - the satisfaction gained. For example, in determining the best use of their time, students must weigh the additional costs and benefits of spending another hour studying rather than doing some other activity, such as listening to music with friends. School officials must decide to use limited funds for more books for the library, helmets for the football team, or new computers for the classroom. Similarly, members of Congress must decide how to use limited tax revenues for a multitude of different program options. In all these decisions, people and organizations use personal and societal values to come up with the best choice. Since these values often vary widely, decision-making is often accompanied by much debate and disagreement, with the final decision involving significant compromise and trade-offs. List the costs and benefits of buying and caring for a pet. Discuss which pet provides the most benefits versus the most costs. Be prepared for a debate! Decide which end-of-year field trip to take. Should the class visit: 1) a local dairy farm 2) the State Museum or 3) a nearby state park? List and discuss the trade-offs with each decision. Write a paragraph explaining your choice. Decide how your school board should spend $50,000 for your school. List various spending alternatives and make a decision, noting trade-offs. (You don't have to spend all the money on one thing.) Role-play the school board meeting. 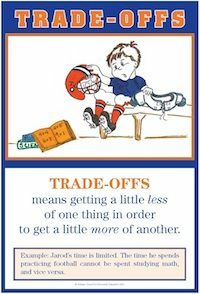 Draw pictures that illustrate the concept of trade-offs. Make a bulletin board of the pictures titled, "Decisions Involve Trade-offs."